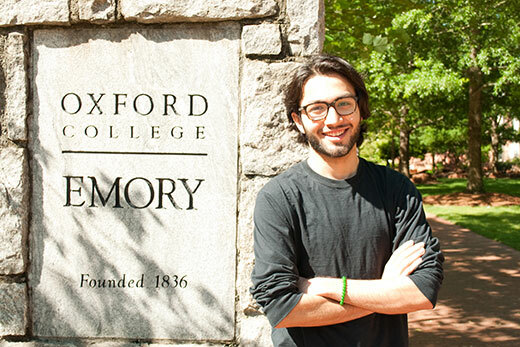 As Muhammad Naveed heads to Emory's Atlanta campus to complete his undergraduate education, he brings a record of leadership as president of Oxford's Student Government Association. When it came to choosing a college, Muhammad Naveed could have gone in either of two directions — literally. Aitchison College, the preparatory school he attended in his hometown of Lahore, Pakistan, is based in the British educational system. Many of its graduates attend university in the United Kingdom, Canada or elsewhere in the British Commonwealth. Naveed himself was accepted to St. Andrews University, the University of Cardiff and University College London. He and his friends were also applying to U.S. schools, though, and Emory was on their list. He was accepted and decided to come without ever having actually been on the campus, but a visit he and his parents made in the summer of 2015 assured him that he’d made the right choice. One of the opportunities Naveed took advantage of early in his first year was running for and winning a seat as a senator in Oxford’s Student Government Association (SGA), a natural choice given his interest in political science and his participation in debate at Aitchison. Following a good experience in the senate and at the urging of his friends, he ran for and was elected to serve as SGA president during his sophomore year. The beginning of his term was clouded by tragedy. In July, two Oxford students — Faraaz Hossain, who completed studies at Oxford in 2015 and had entered Emory's Goizueta Business School, and Abinta Kabir, who would have completed studies at Oxford this semester — were killed during a terrorist attack in Dhaka, Bangladesh. It was Naveed's duty to represent the Oxford student body during Convocation, an event at which the SGA president traditionally is one of the speakers, and again a few days later at a campus-wide remembrance event to honor Hossain and Kabir. In approaching his term as president, Naveed had a clear vision of what he wanted to accomplish. By all accounts he has succeeded. Veronica Roman, associate director of student involvement and leadership at Oxford, works directly with SGA. She calls Naveed “an authentic leader — never asking more of his SGA administration than he is willing to give and always advocating for each person to be heard. "He leads by example, acts with intention, and has made Oxford’s campus better," Roman says. This high profile and important role did not keep Naveed from challenging himself academically. He participated in Model UN and was selected for Oxford’s Sophomore Honors Seminar in assistant professor of political science Don Beaudette’s course on political violence in fiction and non-fiction. Naveed’s honors project was on the broad consequences of U.S. drone attacks on the civilian population of Pakistan’s north Waziristan province. At Emory College, Naveed will major in economics and political science, with plans afterward to go on to graduate or professional school. Once again, there will be more than one way he can go, but it seems clear that whatever direction he chooses, it will lead to success and accomplishment.